There are few race weekends as magical as this one, whose half marathon runs on Saturday (followed by the full marathon on Sunday) and features stretches through Epcot and the Magic Kingdom, as well as past Cinderella’s castle and the Tomorrowland Speedway. Saturday, Jan. 12, 2019 • Lake Buena Vista, Fla.
Saturday, Jan. 12, 2019 • Charleston, S.C.
One of three races that make up Southern California’s Half Marathon Triple Crown (including April’s La Jolla Half Marathon and the America’s Finest City Half Marathon in August), this race offers a course whose signature is its sun and surf, with waves crashing alongside the shore for runners for much of the route. Sunday, Jan. 20, 2019 • Carlsbad, Calif.
Fast, very flat and scenic throughout, this race takes runners mostly around the edge of the easternmost island in the Florida Keys, known for its wildly colorful sights and sounds as well as its stunning sunsets. Sunday, Jan. 20, 2019 • Key West, Fla.
Run through the area known to locals as the “Olde Naples” section of town, this event takes runners through the city streets, residential neighborhoods and waterfront districts of this city near the state’s southern tip and just a short drive from Everglades National Park. Sunday, Jan. 20, 2019 • Naples, Fla.
As its name suggests, this race gives runners the chance to run along the oceanside highways of the windswept western coast of Maui, one of Hawaii’s most popular travel and beach resort destinations. Plentiful sunshine, beaches, island parks and some of the world’s most gorgeous sunsets are what travelers come from across the country to visit St. Petersburg for on Florida’s Gulf coast, and they’ll get to see plenty of all of those at this race. Sunday, Jan. 20, 2019 • St. Pete Beach, Fla.
Run through the heart of the Texas state capital at this mostly downhill race, which takes runners past local sights like the Austin Arboretum and the Stack Valley Greenbelt before finishing in front of its iconic capitol building. Sunday, Jan. 20, 2019 • Austin, Tex. Described by past participants as a beautiful course with plenty of fresh air and rolling hills, the race takes runners along a loop course through the 13,000-acre resort’s neatly manicured gardens, bicycle trails and woodlands. Saturday, Jan. 26, 2019 • Pine Mountain, Ga.
From its gleaming condominiums and towers that look over the waves of the Atlantic Ocean along the shoreline, Miami is no doubt one of the nation’s most colorful, cosmopolitan and unique cities, and all its charms are on display along the course at this race. Sunday, Jan. 27, 2019 • Miami, Fla.
Nestled just off the coast of Savannah near Wilmington Island and the mouth of the Savannah River along the border between Georgia and South Carolina, Tybee Island still has much of its wild, untamed natural beauty, scenery that runners will get to take in at this race. Saturday, Feb. 2, 2019 • Tybee Island, Ga.
Run along the city streets of this beach town just outside Charleston, this race takes a few hundred runners and walkers each year along a seaside tour of gorgeous beach homes, oceanfront vistas and more. Saturday, Feb. 2, 2019 • Folly Beach, S.C. If you’ve ever traveled to San Francisco and driven through or just walked past the gorgeous landscape that is Golden Gate Park, then you know why Runner’s World magazine ranked this as one of the country’s most scenic half marathon races. Sunday, Feb. 3, 2019 • San Francisco, Calif.
Twenty bands spread throughout 13.1 miles, all playing music to pump up runners throughout this city on Florida’s Gulf Coast, from rock bands to high-school marching bands and everything in between. Sunday, Feb. 3, 2019 • Sarasota, Fla.
Often mentioned as one of the nation’s best all-around road races, this event follows a long, scenic out-and-back course along the Pacific Coast Highway, and includes stretches past the famed Huntington Beach pier and the Bolsa Chica Wetlands. Sunday, Feb. 3, 2019 • Huntington Beach, Calif. Featuring a course that’s quite unlike any other in the world, the Daytona Beach Half Marathon takes runners on a 13.1-mile course from the world center of racing to one of the world’s most famous beaches and back. Sunday, Feb. 10, 2019 • Daytona Beach, Fla.
Sunday, Feb. 10, 2019 • Jacksonville, Fla.
More than 10,000 runners and wheelchair participants trek the streets of what is probably the country’s most culturally, architecturally and musically interesting city at this race, which runs in the days after Mardi Gras, the annual pre-Lent party to end all parties. Sunday, Feb. 10, 2019 • New Orleans, La. A beautifully scenic and very challenging race that has won raves from publications like Runner’s World magazine, this race offers a rugged desert course and what is usually a smaller field than bigger-city races. Sunday, Feb. 17, 2019 • Apache Junction, Ariz. This race takes runners through many of the tree-lined and sun-splashed resort’s most scenic and famed attractions, including the Magic Kingdom — and its Fantasyland, Tomorrowland and Adventureland — the green fairways of the Walt Disney World Golf Complex. Sunday, Feb. 24, 2019 • Lake Buena Vista, Fla.
Run just a short drive from nearby Port St. Lucie, this race takes runners through this stretch of the “Treasure Coast,” named for the ships carrying treasure that ran aground here in the 17th century thanks to the plentiful coral reefs just off the coast. 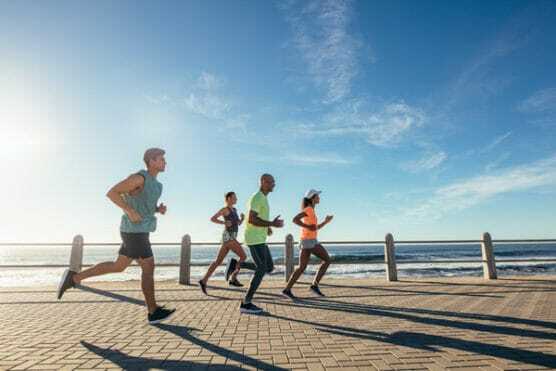 Sunday, March 3, 2019 • Jensen Beach, Fla.
A mostly fast and very flat — and highly scenic — run through the streets of Miami and Miami Beach await at this race, which offers ample views of the ocean waves crashing against the shore and the art and architecture of the city’s world-famous South Beach. Sunday, March 3, 2019 • Miami Beach, Fla.
Run the golf cart paths that wind along the tee boxes, fairways and greens of The Shoals, a 36-hole golf course tucked in Alabama’s northwest corner just outside Muscle Shoals, Ala., a city of nearly 15,000 people that’s probably most famous for its music. Saturday, March 16, 2019 • Muscle Shoals, Ala. The long, wide white-sand beaches of Florida’s Fort De Soto Park, located just a few miles southwest of St. Petersburg, are the setting for this race, which usually draws more than a thousand runners each year. Sunday, March 17, 2019 • Tierra Verde, Fla.
Run just as winter is giving way to spring in Southern California, this race takes runners on a tour of this beach city perched atop the dunes overlooking the Pacific Ocean near San Diego, along a course that runs through Encinitas and the nearby towns of Cardiff and Solana Beach. Sunday, March 31, 2019 • Encinitas, Calif. When I went to Disney World to do the RunDisney Half Marathon (which was cancelled) it was freezing down there! Thanks for this website Terrell, you pack in a lot of useful information. I recently ran my 2nd Half in Dalton, GA and I’m hooked for life. The Florida Publix Marathon Weekend in Melbourne, Florida – Feb 10 & 11, 2018 – Should be on your list – A challenging Marathon, Half Marathon, & Relays on Sunday and 5K & 8K on Saturday. Over the Beautiful Indian River Lagoon Causeways connecting the Beaches to the Mainland. I have run the Tybee Island half several times and one year almost froze! But I guess if you are coming from most of the country in February it would be comfortable temps. I do have Key West on my bucket list.